The Ragdoll kitten and cat breed have only been around for about 50 years. Developed by the Californian Ann Baker, who wanted to create a cat breed that consisted of a gentle spirit, large size, and tendency to go limp (like a Ragdoll) when in contact with humans. She began breeding her famous semi-feral longhair Persian cat, Josephine, who became the fountainhead for the entire Ragdoll breed. Interestingly enough, the breed is defined by its personality just as much as its physical qualities. True to their name, they seem to completely go limp and relax in the arms of people. Ragdoll cats don't generally hunt. Ragdoll kittens and cats are considered placid and completely affectionate to human beings. They're gentle around children and the elderly. In fact, Ragdolls are so docile and affectionate towards humans and other animals that they should be kept indoors. Their docility makes them easy prey for coyotes, hawks, and other aggressive hunters. They don't jump. They prefer to lounge and usually have soft, quiet purrs rather than loud yowls and meows. Ragdolls also try to avoid scratching. 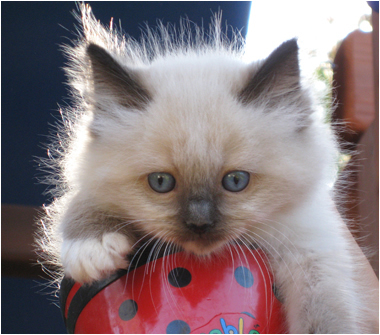 If you're looking for a kind hearted, peaceful kitten - Ragdolls are the perfect breed. Physically, Ragdolls are considered longhaired. Ragdoll fur is as soft as a bunny's. Their coats are thick and their markings are Persian/Angora. To the untrained eye, they're sometimes confused with Siamese cats. 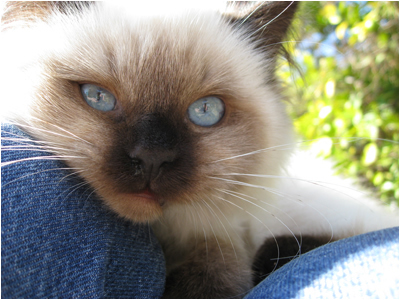 But ragdoll temperament is much more affectionate and docile than the Siamese breed. 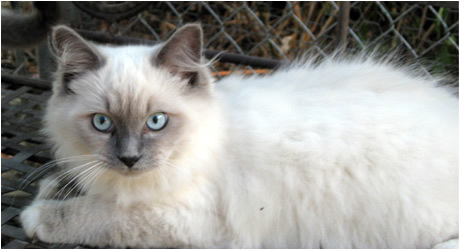 Ragdoll kittens are born white, typical of all "pointed" cat breeds. A pointed cat is defined as a cat that is born solid white, but the coloring darkens over time as the cat "cools." It is typically a few years before the ragdoll kitten coat reaches it full darkened color. Ragdoll kittens in colder climates typically darken faster. It takes about two years for most ragdoll kittens to grow its full, darker coat. Neutered male cats usually reach 20 lbs in weight by their 4th birthday. Females are typically much smaller. 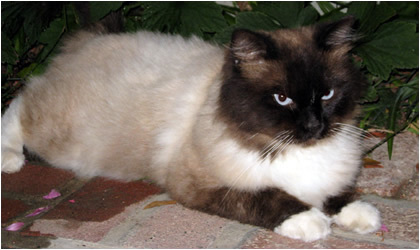 The ragdoll breed is separated into patterns and colors. 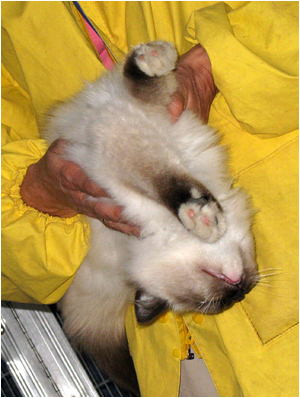 The pattern defines locations of the ragdoll kittens markings. The colors define what color the markings are. Solid: one solid (point) color without recognizable stripes, spots, ticking, white, or silvering. Color Point- have dark well-defined points. Body color is lighter than the point color, but must be solid to the roots with no white patches. Mitted- have well-defined points, except on the feet where they have a matched set of snow-white mittens. Hind legs are entirely white, but the white should extend no higher than mid-thigh. A white blaze can decorate the nose. Bi-Color - have a white mask like an inverted "V" plus white on all four legs, feet, stomach chest and ruff. Other white patches and markings can appear, except on the point, which are dark and well-defined. Lynx - have Lynx type stripes on the points of the body. They may also come in Mitted or Bi-color patterns. One of our Seal Point kittens!